We’re in California, so we’re spoiled since it’s the only state in the US where lane splitting is legal. In Europe and much of the rest of the world, lane splitting (also called filtering, lane sharing, or white-lining) is commonplace, but in the US it’s regarded as an unsafe practice by most states and auto drivers. So if you’re reading this outside of California but inside the US – you can’t lane split. Bummer. But for all you California riders – good news! Lane splitting is great! The AMA has put together some research showing the safety of filtering through traffic as compared to sitting in the traffic. After years of commuting by motorcycle, my experience completely supports the report. I feel much more unsafe when I cannot split. Drivers in traffic are often not paying much attention. Rolling into another car at low speeds isn’t that big of a deal (in the grand scheme of accidents) – but it’s a huge deal if you roll your 1500lb car into a motorcyclist. I’ve watched probably 20 people get rear ended in traffic in my 5+ years of motorcycle commuting. As I’ve said before – you should NEVER do anything on a motorcycle that you’re not comfortable with. Cutting between lanes of traffic is an intimidating maneuver, and if it petrifies you to even think about it, it’s ok to decide that it isn’t for you. The first couple of times you try it you might be super slow and apprehensive. That is normal – just like any new thing you try on a bike. You might try it for short distances at first as you get the hang of it, but I promise it’ll start to feel like regular riding after some practice! So – how should you split lanes? The California Highway Patrol used to have super useful guidelines for lane sharing up on their website, but they were taken down before the passage of AB 51 which officially legalized lane splitting beginning in January 2017 and have not been put back up. The official law states that it can be done “when safe” which leaves a lot of interpretation up to the officer citing you for unsafe lane sharing. In the absence of official guidelines, you’ll have to trust my wisdom! In almost every scenario, you should pass between the number one and the number two lanes. This means between the fast lane and the second fastest lane. We’ve worked really hard to train drivers to look for us over here, so don’t mess up the flow by splitting down the middle of the highway or riding on the shoulder. A good rule of thumb is to never go more than 10mph faster than the surrounding traffic. You want to be able to react quickly and safely if a car doesn’t see you and changes lanes in front of you – because that will happen. If traffic is completely stopped you shouldn’t go more than 10mph through the lanes. The old CHP guidelines used to recommend getting back into the lane at 40-50mph. I have found that most motorcyclists choose to get back in to the lane around 50-60mph. 50mph is about when cars give each other more space and you have less stop-and-go to worry about. Be Polite to Other Bikes! If you see another motorcyclist coming up behind you while you’re splitting lanes, be polite and move out of the way to let them pass when it’s safe to do so. It’s a lot easier and safer for you to just slow down and get into the lane between two cars when you can than it is for you to try and speed up and go the speed of the other motorcyclist. It’s also safer for you to let them pass than for them to try and pass you when you’re not ready for it. If you’re the faster bike, be kind to the person in front of you. 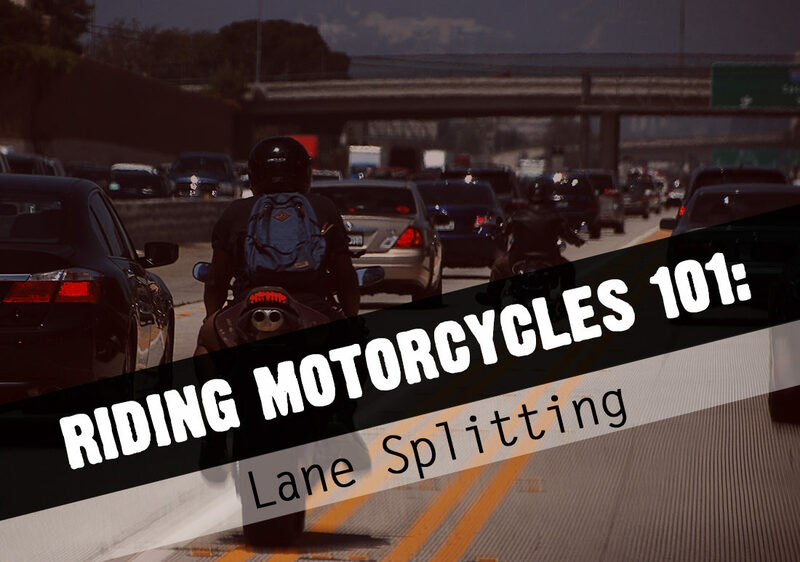 They might be new to lane splitting and aren’t sure how to let you by. Give them enough space and only pass when it’s safe to do so. Car drivers can be jerks. Sometimes they’ll intentionally block you from splitting (which is illegal in CA, but that doesn’t mean anything when you’re on a crowded highway), sometimes they’ll swerve for the bike in front and not see that there are two bikes, sometimes they’ll change lanes without looking or signaling…it’s a mess. No matter how much of a jerk the car driver is being, just let it go. Wave thank you when cars move out of the way, just move along for anyone else. I like to pretend that I am 100% invisible when splitting lanes and every car is potentially being driven by a one-eyed cat – the only one who can keep me safe is ME. This is probably good advice for most motorcycling, but I find it especially good advice for traffic. Sure, you might have the right of way or otherwise be in the right, but that doesn’t matter if you’re dead or severely injured. If someone really wants to be in front of you – just let them pass. It’s not a race, it’s traffic. After you’ve been splitting lanes for a while, you’ll notice some things that happen over and over again. Here are some of my tips for keeping yourself safe out there! Watch wheels and mirrors – a lot of drivers don’t signal, but they all turn their wheels and check their mirrors. I can’t even count the number of times I’ve anticipated a car coming into my space without a turn signal just because I saw them check their mirrors and turn their wheels ever-so-slightly. Use your brights – I have found that turning on my brights in challenging lighting (dusk, just after dark, unusual traffic) helps cars to see me a little better. Use the safest path – On any commute you’re going to have some weird spot where you find yourself splitting through the gore point (the triangle at an offramp), filtering through lanes you don’t want to be in, or passing along a shoulder. Always stay where the cars are most likely to see you, and where you are least likely to be hurt. There are a few places in San Diego where I’m pretty sure I’m riding where a cop could ticket me, but I would rather pay a ticket for riding a few hundred feet on the shoulder than get creamed by an inattentive driver.